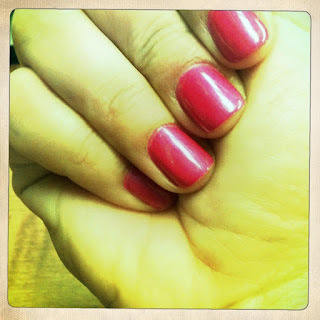 Oh, the Life: Shellac is Where it is AT! Have you ever gotten a manicure and it last for oh about a week if you stay indoors and no sort of living at all? Who wants to pay for a manicure, and polish, when it last less than a week? I was getting tired of it and decided to try Shellac! and Must say I will not go back to a normal polish for my nails! It stays on for at least 2 weeks! Helps your nails get stronger and grow! I am an outdoor girl, and not easy on painted nails! I had my last one on for 15 days and it hadn't chipped, just started to grow out at cuticles. This is the second time I've heard about this! I just read about it on The Pioneer Woman blog. Where do you get it done? Just normal manicure places? Or fancy ones? Yeah just a normal manicure place should carry it. Now EVERY one may not carry it, but I don't go anywhere fancy, come on it is Kerrville. Fancy doesn't necessarily come to mind when I hear Kerrville! And yeah it is called a "Photo Effect"